Sergeant G J M PEGG 106034 3rd Div. Train, Canadian Army Service Corps who died on Sunday 28 May 1916. Age 39. Tubby Clayton (Talbot House) : "In the early summer of 1916, boastful of the beauty of the garden, we put up a notice saying : 'Come into the garden and forget about the war', and almost the first acceptance of the invitation was intimated by arrival of a 5.9 wich blaw sideways into the House, mortally wounding a Canadian who had come in with his brother to write a joint letter home." The Canadian in question was Sgt. G. Pegg, aged 39 years. He was killed on 28 May 1916 and is buried on Poperinghe New Military Cemetery. 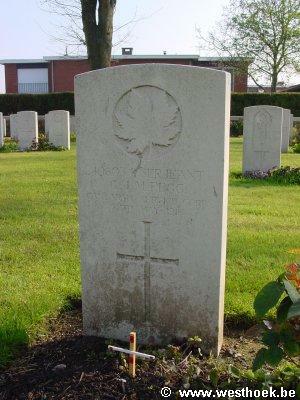 His headstone bears the inscription : "He fought his good fight …" (Info : Brochure 'Talbot House', vzw Talbot House van Poperinge) Sergeant G J M PEGG 106034 3rd Div. Train, Canadian Army Service Corps who died on Sunday 28 May 1916. Age 39. Husband of Rachel Pegg, of 618, Spence St., Winnipeg. POPERINGHE NEW MILITARY CEMETERY Grave II. D. 1.